Here they are, the delicious treats my mother prepared for us when we stayed at her house in the countryside last weekend! I have to leave out the first dinner of the evening we arrived, I was too hungry and exhausted to take any photos after the six hour drive. I got a beautiful aperitif, white wine mixed with Limoncello and mint and I was told to sit down and relax (my family knows that this is not always easy for me to do). So we all gathered in the kitchen, watched my mother cook a fruity tomato sauce with bell peppers and spaghetti, chatted and were happy to be together again! 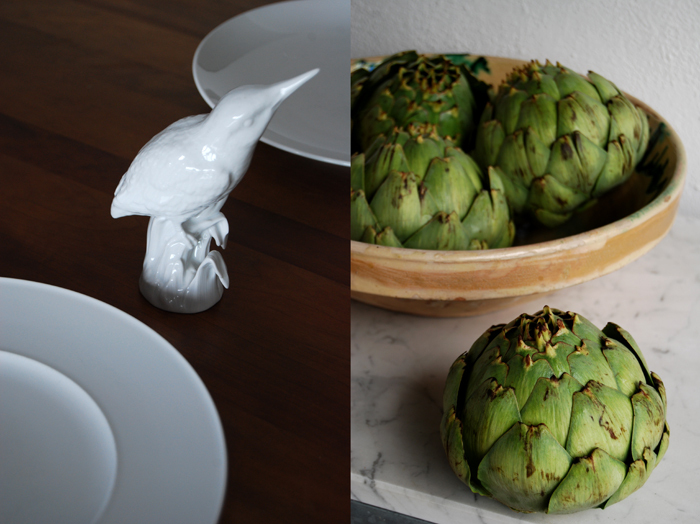 Today I will share the recipe we enjoyed on the second night, artichokes a la Mama with three kinds of dipping sauces. This is one of her summer classics! 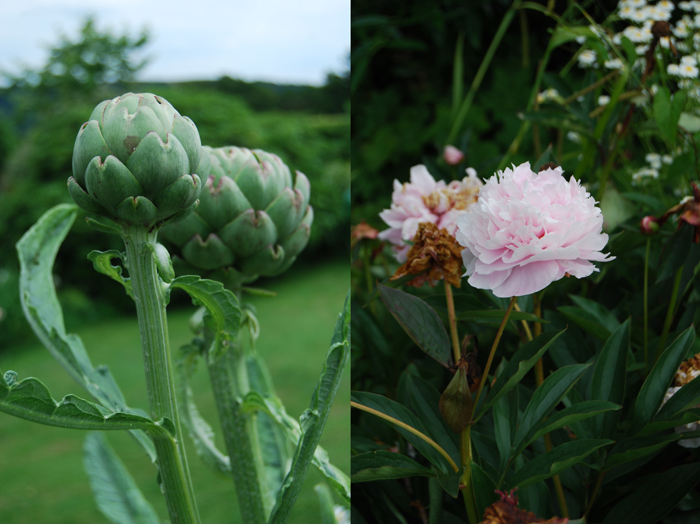 She uses big globe artichokes with fleshy leaves, the same kind as those ripening in her garden. It’s the first year that she has grown them herself and they look impressive, big plants with a strong stem crowned by a majestic globe, simply stunning! Their leaves are perfect to dip into sauces, there’s a lot to nibble on before you finally reach the heart which is thick and tasty once the hairy choke is cut off. My mother always makes a few different sauces, most of the time it’s a classic mayonnaise, a smooth tomato dip with black olives, thyme and basil and a yoghurt dressing mixed with hardboiled eggs. In the next couple of days I will share three more of her recipes with you, one of the best fish soups I have ever eaten, refined with saffron and cooked with king prawns, wolfs fish and cod. Last Saturday we went a bit overboard on the sweet side and we had two desserts in one day, both are so quick to prepare that you can easily make (and eat) them after each other! Cook the artichokes in lots of salted water together with the lemon for 35-45 minutes (closed with a lid) until you can easily pull off an outer leaf. My mother whisks the mayonnaise by hand but you could also mix it with a stick mixer in a mug like I did with my aïoli. Whisk the egg yolks and slowly add the olive oil. Stop adding more oil when the texture is thick (it will take a few minutes) and season with the lemon juice, mustard, salt and pepper to taste. 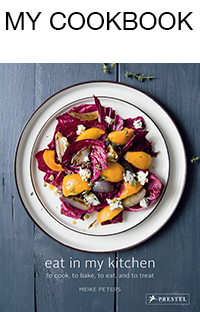 Mix the ingredients with a spoon to a smooth dip and season to taste. Mix the ingredients (except the chives) with a spoon to a smooth dip and season to taste. Sprinkle with chives. Beautiful photos, Meike. 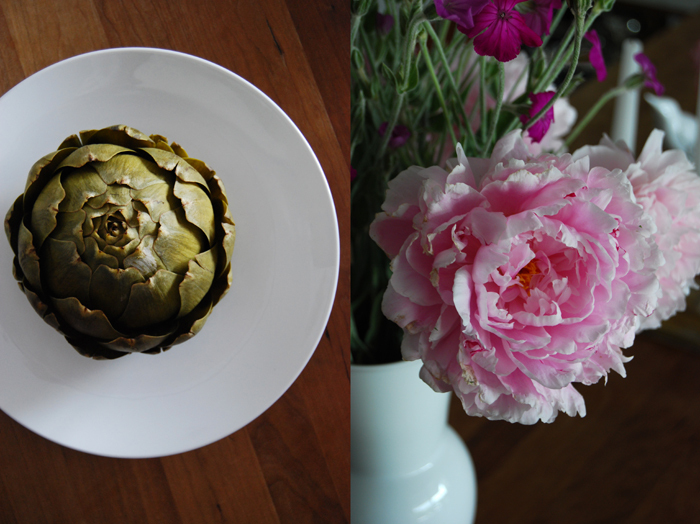 I love artichokes, but have never cooked them…it is just too easy to buy them already canned or frozen. Thank you Marigene! We had such a great time! 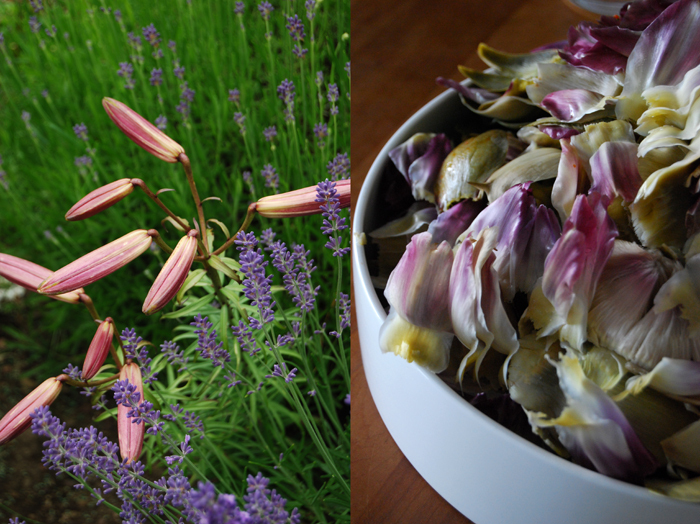 I love spending time at my mother’s house, her food and the garden is heavenly! 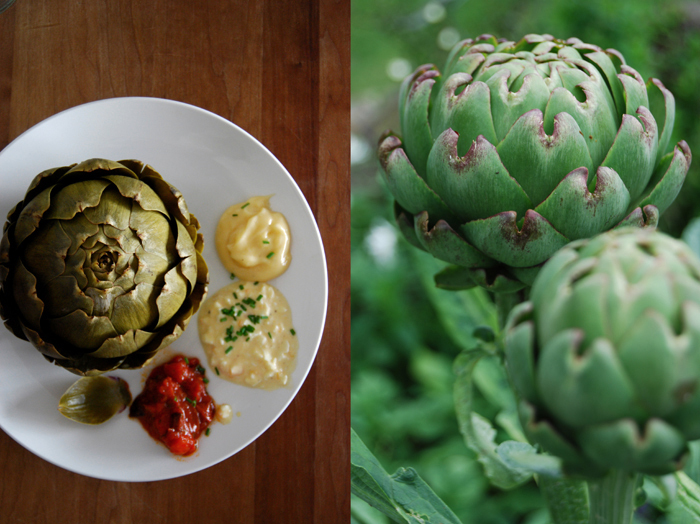 You should try homemade artichokes, they taste so different to the canned ones (which I like to use for pizza) and they are so quick to prepare. 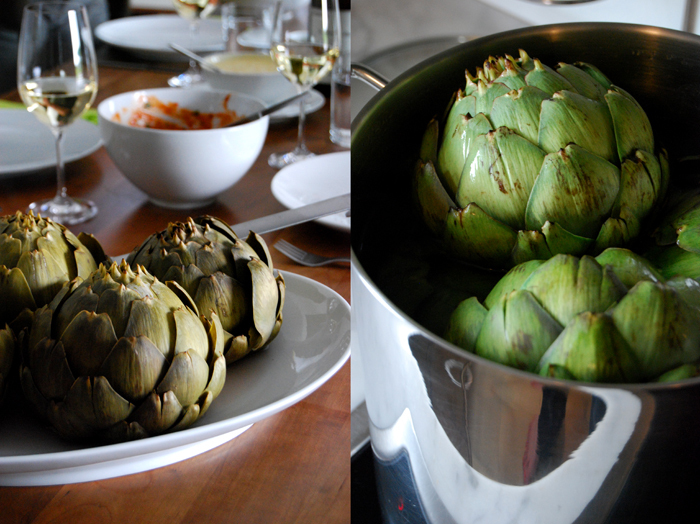 I like to cook them when friends come over, you just put a big bowl of artichokes on the table and a few dips!